Real estate company HomeVestors buys ugly homes. That's their motto. 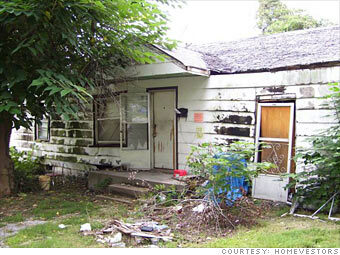 We asked them to show us some off some of the most atrocious homes in their inventory. Each year HomeVestors holds an Ugliest House contest and this beauty from Springfield, Mo., was one of the 2010 winners. But don't get attached: It's no longer on the market. There can be a lot to love about a homely house -- particularly the steep, steep discounts. Few home seekers want to put time, money and effort into fixer-uppers, so these homes must be offered very cheap. So anyone handy and with a few extra bucks and hours to spend might find themselves with a nice place for the right price -- and that can be a beautiful thing.